The New York Times published an op-ed Monday written by a convicted terrorist, without informing readers that he is serving five life sentences in prison for helping murder five people and launch a failed suicide bombing. The op-ed, titled "Why We Are on Hunger Strike in Israel's Prisons," was penned by Marwan Barghouti and appeared both online and in the print edition of the International New York Times. The Times author bio described Barghouti as "a Palestinian leader and parliamentarian." "Having spent the last 15 years in an Israeli prison, I have been both a witness to and a victim of Israel's illegal system of mass arbitrary arrests and ill-treatment of Palestinian prisoners," Barghouti writes. "After exhausting all other options, I decided there was no choice but to resist these abuses by going on a hunger strike." Throughout the op-ed, Barghouti only vaguely alludes to the reason he is in prison. "Israel has tried to brand us all as terrorists to legitimize its violations, including mass arbitrary arrests, torture, punitive measures, and severe restrictions," he writes. "As part of Israel's effort to undermine the Palestinian struggle for freedom, an Israeli court sentenced me to five life sentences and 40 years in prison in a political show trial that was denounced by international observers." In reality, Barghouti was sentenced in 2004 to five consecutive life sentences for masterminding a series of terrorist attacks on Israeli police and civilians, including a Greek Orthodox priest. Barghouti was also found responsible for a failed suicide bombing that ended up killing the terrorists instead. Despite his claim of a "show trial," Israeli judges actually acquitted Barghouti of most of the charges against him. Israeli authorities believed he was directly responsible for as many as 37 attacks, but judges ruled they lacked sufficient proof of his involvement in many of those cases. Israeli media and American Jewish figures castigated the Times for omitting the full details of Barghouti's activities. "Shame on NYT for printing libelous op-ed by convicted killer Barghouti, the Palestinian Dylann Roof," wrote former Israeli Ambassador to the United States Michael Oren. "Americans would be horrified. So are we." Israeli politician Yair Lapid accused the Times of "intentional deception" by publishing the op-ed without giving full context of Barghouti's crimes. "Anyone who reads the column without prior knowledge of the facts will come to the conclusion that Barghouti is a freedom fighter imprisoned for his views. Nothing is further from the truth. The missing part of the column is that Marwan Barghouti is a murderer," Lapid wrote in the Times of Israel. Israeli Deputy Foreign Minister Tzipi Hotovely said that publishing Barghouti, a "murderer and a terrorist," undermined the credibility of the newspaper. "Barghouti is not a prisoner," she said in a statement. "He is a convicted murderer and a terrorist. 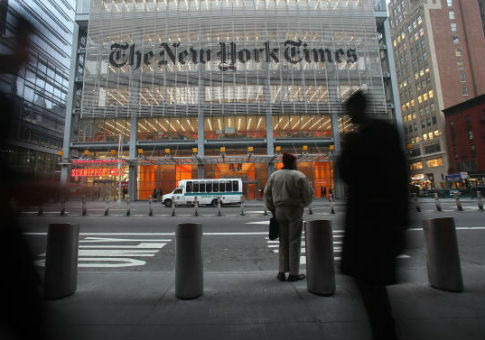 The New York Times has provided a platform to a terrorist without noting the fact that he planned and carried out the cold blooded murder of Jews simply for having been Jews. This is not a matter of freedom of speech. It is anarchy. When a major newspaper with a reputation for responsible journalism becomes a platform for murderers, it provides legitimacy for terrorism. This is a very disappointing decision by the editors which seriously undermines the credibility of the New York Times." UPDATE 3:38 P.M.: This post was updated to reflect comment from Deputy Foreign Minister Tzipi Hotovely. This entry was posted in National Security and tagged Israel, Marwan Barghouti, New York Times. Bookmark the permalink.